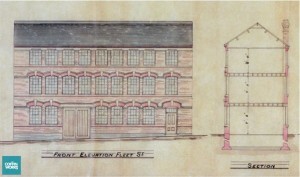 Original architect’s plans of Newman Brothers designed by Roger Harley in 1892. Don’t get me wrong, conservation cleaning is very important, but there’s so much more involved in maintaining a collection than just that. In fact, assuming that a bit of cleaning here and there will keep a collection ‘healthy’ is unhealthy in itself. We are lucky at Newman Brothers to have such a dedicated team of volunteers (too many to mention, but you know who you are!) who lead on conservation cleaning as this directly supports other aspects of our collections care regime, which will be explored in this blog. The Newman Brothers’ collection is one of a kind. 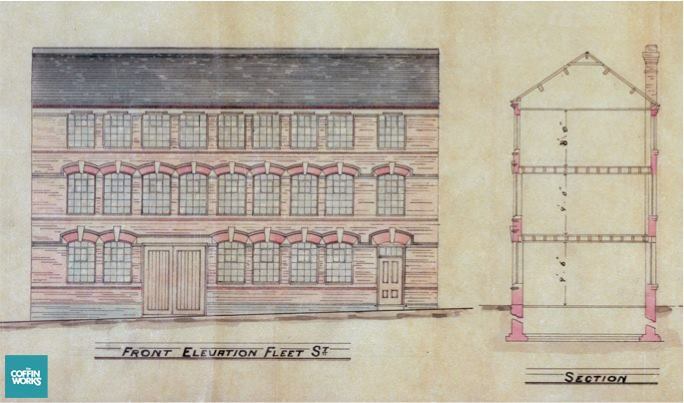 Even more invaluable is the fact that it survives in its original setting; the Newman Brothers’ Coffin Furniture Works – a great example of Victorian engineering, where the design of the building optimised the fluency of its layout aiding efficient production. The preservation of our unique collection requires guardianship to ensure it survives for posterity and there’s a lot that goes on in the ‘background’ to ensure that. A fundamental part of our preventative conservation regime, on which everything else hinges, is first of all starting with creating the ‘right’ environment. For this, we need to control the light, humidity and temperature. 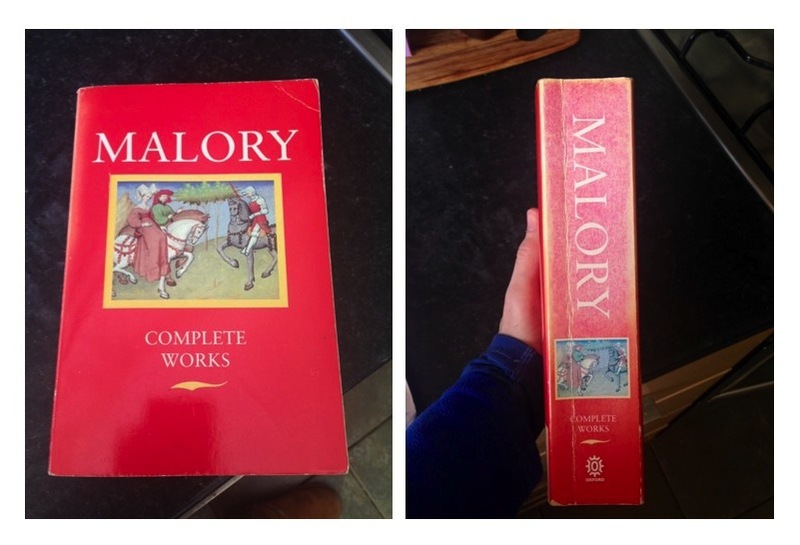 Without the right environment, our collection will quite simply deteriorate. So let’s first start with light. Light is electromagnetic radiation, which is a form of energy. 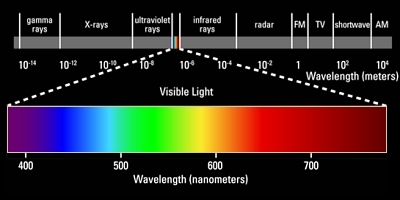 Visible light is just one type, and a small part, of electromagnetic radiation on the electromagnetic spectrum. The visible part of this energy spectrum includes the colour of the rainbow which we can see with the naked eye, but beyond that, at the violet end of the spectrum, is ultraviolet radiation (UV), which has more energy than the visible part. Because of its high energy, it will damage objects faster than visible light by breaking down chemical bonds, causing objects to fade. 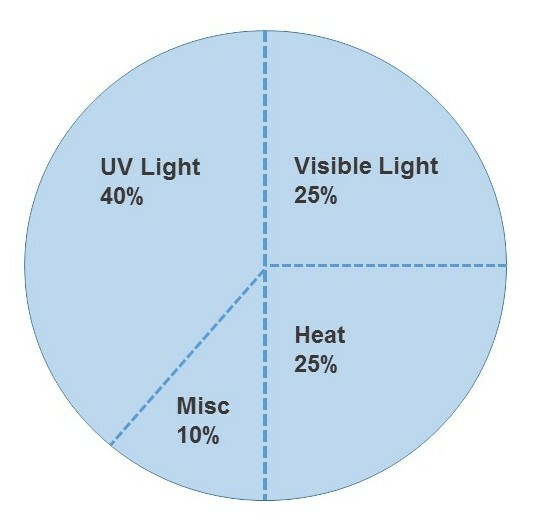 So how do we control visible light and UV radiation levels to prevent damage? Well, we do this in a number of ways and one of the most important at Newman Brothers is our use of UV-filtering film, which is on windows in the heritage spaces. UV light has the potential to create the most damage and our film blocks out around 99 percent of all UV radiation from sunlight, but even this doesn’t last forever and will need replacing every 10 to 15 years. But UV light isn’t the only threat to our collection. In fact it only accounts for 40% of all potential damage. Most of us have surely noticed the glorious weather over the Easter holiday. Although the temperature only reached a high of around 21 degrees, this significantly increased the heat level in all of our rooms. This can create uncomfortable conditions for our visitors, but it’s also detrimental to our collection and accounts for up to 25% of damage to objects. 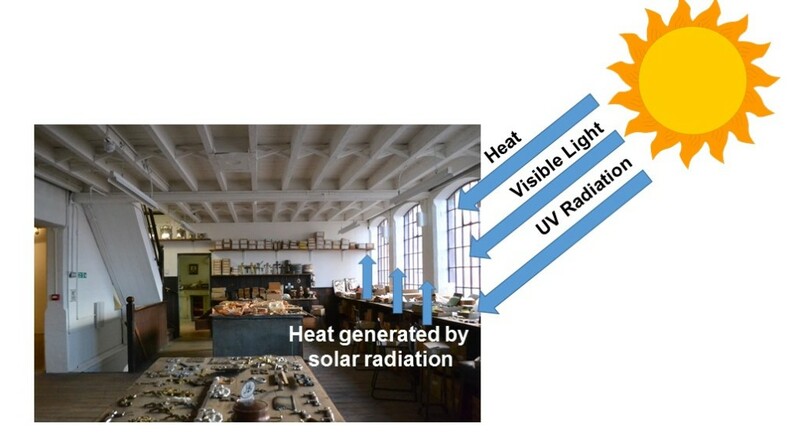 As heat, also referred to as solar radiation, enters a room it is absorbed by objects in our collection causing the temperature to rise. 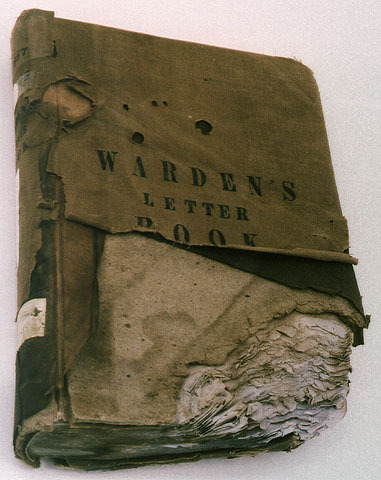 It is this continual heating by the visible light, combined with the UV, that results in the structure of objects breaking down and eventually leading to discolouration, just like the book below. This is the result of light damage over a few years and is a warning with what is luckily a replaceable object. Light damage is permanent, meaning that once our beautiful and colourful Shroud Room fabrics fade, there’s no going back. Measuring and recording light as well as room temperatures regularly is key and this is the job of the Collections & Exhibitions Manager along with the collections support volunteers. Visible light causes up to 25% of all damage to objects, but as it’s lower in energy than UV radiation, in general its damaging effects are slower. Crucially though, all light exposure is also cumulative, meaning that all objects exposed to light will progressively deteriorate. We can fortunately slow this deterioration down. How? Light is measured in lux and this can be achieved by reducing the ‘lux’ hours of exposure – the total light intensity multiplied by time. So in a heritage attraction like Newman Brothers we should ideally be aiming for light exposure of no more than 200 lux for our moderately sensitive materials such as wood and plastics and even lower for our textiles. Blinds are crucial in controlling this exposure. 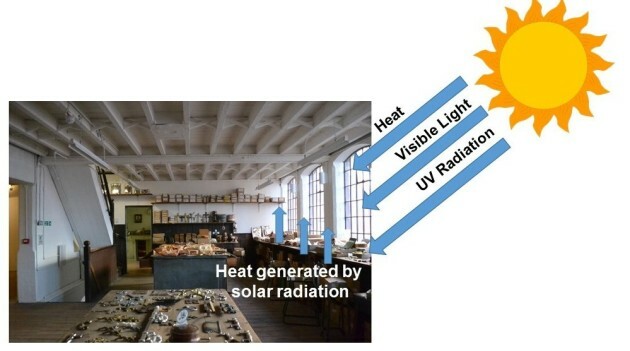 Without them, Newman Brothers may as well be treated as being open every day of the year, meaning that the total exposure of sunlight in one year is 4,484.5 when the National Trust, for instance, recommends no more than a total exposure time of 1,000 hours for light sensitive materials. Even more of a worry is that our building receives direct sunlight for a large proportion of the day and direct sunlight in the UK can reach 50,000 lux. Just three hours of constant sunlight can expose a collection to its maximum annual dose. Blinds therefore, and monitoring and recording information are crucial to our preventative conservation regime. Controlling temperature and humidity are also central in creating a stable environment. With the warmer weather, there have been quite a few comments at work recently requesting that we turn the heating off. But we actually shouldn’t have to do that. At Newman Brothers we have something called conservation heating which is controlled by a humidistat rather than a thermostat. This switches the heating on and off when the Relative Humidity (RH) goes above or below a set point. We aim for around 58% with our mixed collection, which is a good compromise for a range of materials from wood, metals, textiles to plastics that all enjoy varying RH levels. Without getting too technical, it’s crucial to keep the RH as constant as possible and we only allow for a 10% fluctuation over 24 hours. Why is this? 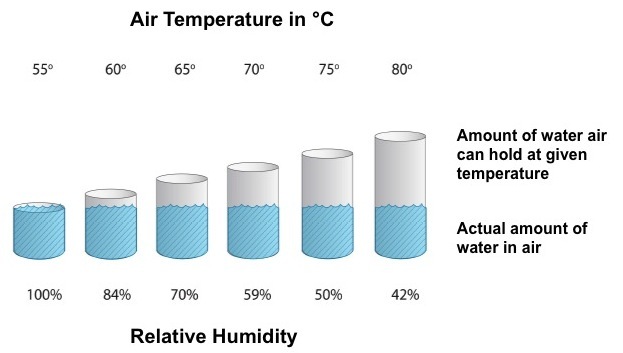 Relative Humidity is the amount of water air can hold at a given temperature. In general, as air gets warmer it expands and has the ability to hold more water. As air cools, it contracts and can’t hold as much water. By their very nature, organic objects try to come to equilibrium with the moisture in the air, meaning that if there is too much moisture around, things like paper, textiles and wood will try to absorb it, and similarly, if the air is too dry, they will give off some of that moisture. This makes organic objects swell, change shape and lose strength. For instance, when they expand, they crack, but when they contract, they warp and split. Added to the mix is mould and pest activity if the RH gets too high. Although our collection is in a good condition, the effects of incorrect humidity and temperature during the period when the building was ‘abandoned’ are obvious if you look hard enough. We can now slow this down. This is why maintaining a stable environment is fundamental and to do this we can’t alter heating unnecessarily, open windows whenever we like or leave our wet brollies and coats lying around. It’s not only important to measure and record levels, to enable us to be reactive, but as a heritage attraction that cares for its collection, we do this by striving to perform to industry-set benchmarks. Crucially, these have to be maintained. So, it’s definitely not a case of putting our collection on display, leaving it and hoping for the best. I don’t need to spell out the outcome of that and we all know what happens when we neglect upkeep of assets like our cars! 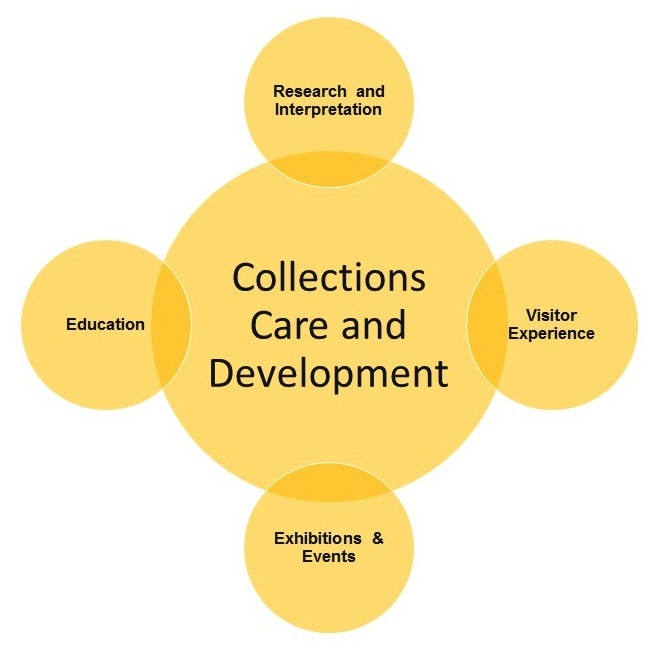 Caring for our collection is core to what we do and who we are as everything from our guided tours, education and outreach, exhibitions and events are inspired by it. Without it, we lose our best asset, we quite simply lose our selling point. Look out for our next blog exploring our Pest Management at Newman Brothers and our relationship with our creepy crawlies!